Situations in which medical care or advice should be provided vary considerably as regard place, time and the extent of the medical problem, i.e. patient’s state as regard consciousness, cooperation, presence of patient’s relatives, etc. 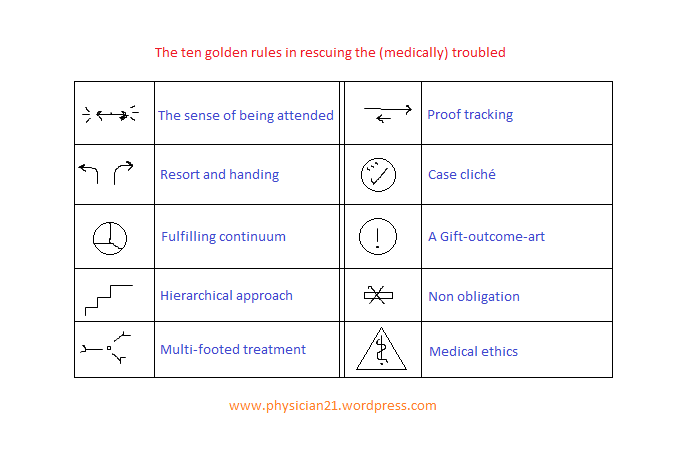 Here are 10 rules that I wish to conclude from my experience in the clinical field. 1- The sense of being attended: the health care provider should stress and make sure that the patient perceives that a good medical care is being present. This would be achieved by speaking gently and confidently with the patient and/ or with the relatives. The doctor may state clearly that he/ she would have no problem to see the patient for free when the patient’s condition money-wise is not favorable. The doctor should be cautious as much as possible to protect the patient from possible negligence by his/ her relatives. In case of a patient with perturbed consciousness the doctor would call the patient by his/ her name (if known) and hold the patient hand warmly. 2- Resort and handing: the doctor would have preliminary assessment of the medical problem, and recalls his/ her knowledge and may need to find some source as a book or contact a colleague for consultation. The doctor may have to urge for a referral to a more experienced doctor. 3- Fulfilling continuum: the doctor may inspire that human body is one continuum with dynamically operating modes and proportionately distributed components. This should be very useful in determining the dose, rate, and intervals of the medicines to be used. 4- Hierarchical approach: the management plan should be almost clear from the beginning. The management should assume a hierarchical concept as regard the relevance of interventions/medicines to one another from one side and to the human body function from the other side. 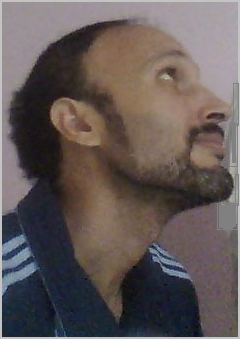 It should start from natural means to encourage the self-curing power in the patient, e.g. warming the patient, changing posture, etc., and proceeding from a less invasive to more invasive. 5- Multi-footed treatment: this means that using more than one point or target in the treatment, if allowable, would help reach a more smooth response with less likelihood of misfortune. This integrated approach would allow less and more tolerable medicine doses. 6- Proof tracking: this means that on following certain treatment the doctor keeps an open eye checking back and forth for the consistency and appropriateness of a given step in the management for a possible need to change the treatment plan. 7- Case cliché: by the time the medical condition is being resolved the doctor should formulate a clear definition of the case (diagnosis) and inform the patient or the relative(s), orally and/ or in writing. 8- A Gift-outcome-art: this means that the outcome of the medical care is quite unforeseeable. Here, the outcome is usually expressed as percentages or probabilities and not as a definitely individualized result. 9- Non obligation: the medical care should not bear any obligation from both patient’s and doctor’s side. 10- Medical ethics: the doctor should be aware of and fulfilling the medical ethics applicable to the particular medical problem being managed.